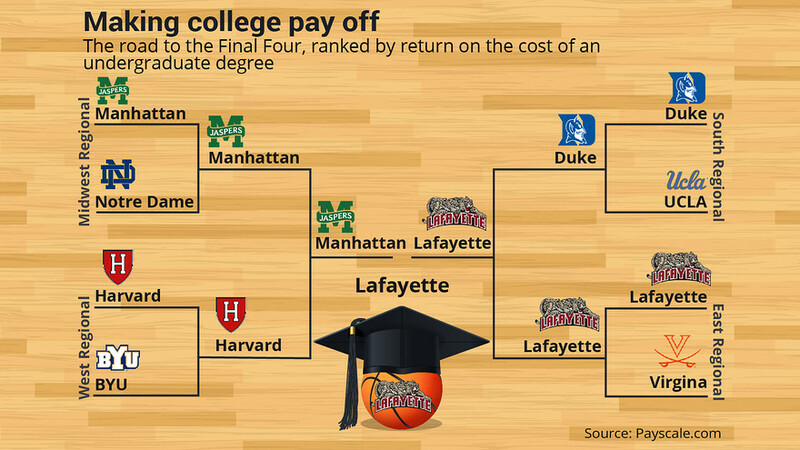 When it comes to the value of a degree, Lafayette is the undisputed champ in the NCAA men’s basketball tournament, besting Harvard, Duke, and Manhattan in the Final Four, according to Yahoo!News and MarketWatch. The two national news outlets configured their brackets using a study done by PayScale.com, which looks at the return on investment (ROI) of an undergraduate degree over 20 years. Payscale calculated the rankings by using investment, or total cost of college without financial aid (tuition, room and board, books and supplies), and comping it to the return, or the increase in salary received by a college graduate over a high school graduate. Money magazine ranks Lafayette in the Elite Eight based on affordability, quality of education, and graduating students into good-paying jobs, after knocking off Villanova in the first round. In a bracket configured by Inside Higher Ed measuring how well teams perform in the classroom, Lafayette makes it to the Sweet 16. It’s no surprise then that the Leopards have one of the highest combined GPAs and graduation rates in the NCAA. In the most recent NCAA Graduation Success Rate (GSR) report, Lafayette’s athletic programs tied for 12th in the nation with a 97 percent overall GSR. Lafayette student-athletes have a federal graduation four-class average of 88 percent, tied for sixth in the country. The federal rates do not take transfer students into account. Also, 17 of Lafayette’s 23 Division I sports, including men’s basketball, received 2014 NCAA Division I Academic Performance Program Public Recognition Awards. These awards are given each year to teams scoring in the top 10 percent in each sport with their Academic Progress Rates. The APR is the NCAA’s measure of academic achievement for every Division I team, and takes into consideration eligibility, retention, and graduation rates. 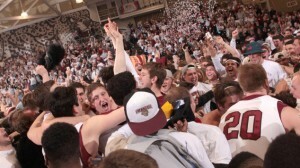 Lafayette earned a berth in the NCAA Tournament after defeating American University in the Patriot League Championship game. I knew it — but nice to see it recognized! Great job in the classroom and the basketball court guys! !